susacobratt-0 has no other items for sale. 🔥 (2 game lot) Gamecube Wii Super Monkey Ball Bundle: 2 AND Banana Blitz! In a series that got its start in 1982, Microsoft has continually updated, enhanced and improved their Flight Simulator on a fairly regular basis. With the release of Microsoft Flight Simulator 2000, the simulation carries its legions of fans and cyber-pilots into the new millennium. 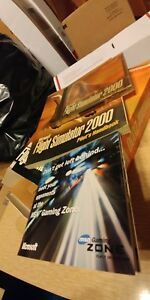 In addition to the basic version, Microsoft is offering a companion game entitled Microsoft Flight Simulator 2000: Professional Edition that contains special advanced features geared toward making the simulation a PC flight training and proficiency aid for advanced players and pilots. Although not a requirement, the game is optimized for the Intel Pentium III. The scenery in Microsoft Flight Simulator 2000 contains 16-bit color, realistic elevation data, seasonal effects and enhanced textures all presented in 3D graphics. As an added option for fans of the series, all of the aircraft, scenery and adventures supported in Microsoft Flight Simulator 98 are compatible with the FS2000 version. Features in Microsoft Flight Simulator 2000 include the addition of two new aircraft, the Concorde (Mach 2) and the Boeing 777-300. For fans wanting even more, the Beechcraft King-Air 350 and the Mooney Bravo can be found in the Professional Edition of the game. The initial default of the game puts the player in the seat of a Cessna Skylane 182S at Meigs Field but offers easy access to other aircraft and options. Just some of the options available for adjusting flight parameters and realism include fuel distribution that affects weight, performance and range, flight characteristics, updated instrument panels, exterior lights, flight controls, engine and propeller concerns and crash/damage aspects. Failure parameters are adjustable -- the user can select either random occurrences or instrument-specific problems -- and can be customized for impact on instruments, systems and radios. Microsoft Flight Simulator 2000 contains more than 20,000 airports (only 3,000 were available in FS98) around the globe, detailed 3D objects (e.g., buildings, vehicles, towers, ships, etc.) and six new cities (12 in the Professional Edition) including Chicago, London, Los Angeles, New York, Paris and San Francisco. Up-to-date weather conditions can be downloaded from the MSN Gaming Zone on the Internet, with real-world weather systems provided by Jeppesen. The simulation translates these conditions into realistic effects such as clouds, precipitation and lightning and allows the user to customize weather as well. Enhanced flight planning and navigation tools have not been ignored by Microsoft Flight Simulator 2000. Moving maps, a Global Positioning System (GPS) and a myriad of features regarding navigation are available. Position updates, ground speed, waypoint targets, route fixes, airport information, latitude, longitude, altitude, airspeed and more are just a few of the in-flight aids offered. This is not a simulator, but merely a game. Do not expect this package to simulate any real aircraft. It also claims to cover every region and airport in the world. This may be true, but the detail is so bad that it is unusable for much of anything. And it has such features as rivers that flow up and down hill (though you must use your imagination to even recognize it is a river). If this were freeware it might be worth considering, but I would never pay for a product like this again, even at the discounted Ebay sellers price. I recommend instead a simulator called "Flight Unlimited", a quite realistic aircraft simulation for PC, that can actually help improve flying skills. I am a certified flight instructor, and I would not recommend any pilot to expect benefits from Microsoft Flight Simulator, other than entertainment. "As real as it gets" should be considered as a trademark rather than a description of the product. The soft ware had been loaded more then three times and would not load again. I was led to believe the software was in its unwrapped packaging as new, it was not. Flight sim 2000, what an enjoyable experience. Great game, older graphics, lots of planes and cities to enjoy. I like older games to play at times, this one certainly fits the bill. I run it on my win 7 system. You can pick up a copy used and new on ebay or other sites for about $20 or less including shipping. If you are thinking about flight sims this is a cheaper alternative to newer ones, try it and decide if you like flight sims. I recommend a joy stick to play this game, much more fun and realistic.